An absolute must in a cutting garden. Cosmos are incredibly easy to grow from seed and as long as you pick them and keep on top of the dead heading they will flower from August until late October. They are the most productive flower in our cutting patch. We sowed our seeds at the end of March and they were ready to plant out by mid May. 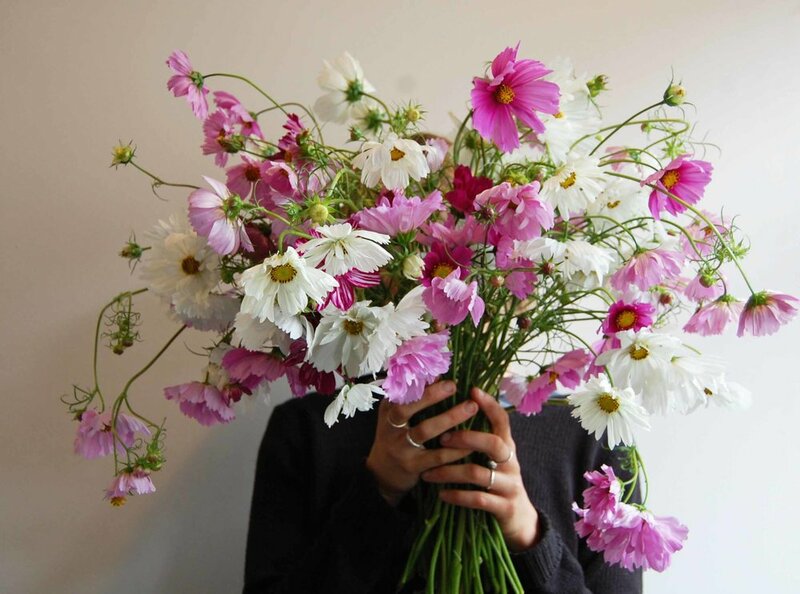 It is important to give cosmos room as they like to spread out so space them about 40cm apart and make sure you stake them as they need support whilst growing. We pinched ours out to encourage even stronger growth. Available in the most heavenly array of candy colours; cream, white, buttercup yellow, the palest of blush, lipstick pink, deep burgundy to name but a few. Their petals range from single to triple to frilly to fluffy. They have multiple flowers on a stem and grow up to 2m tall. They are perfect in all arrangements including bouquets, table displays, large vases and large scale flower installations. In short we would be lost without them. We buy our cosmos seeds from Chiltern Seeds and Sarah Raven, they have the best choice and are great quality. Our favourite cosmos this year was the 'fizzy rose picotee'.